Cookies for a snack. Cookies dipped in tea. Cookies to top off a bagged lunch for a sweet dessert. Anyway you enjoy them, cookies are a treat that everyone on a gluten-free diet should be able to enjoy… and love. And if you’re looking for a moist, chewy and delicious gluten-free cookie treat that will knock your socks off you need to check out Nana’s Cookie Bars. These individually wrapped gluten-free cookie bars come in some great flavors like Berry Vanilla, Chocolate Crunch and my favorite Nana Banana. These cookie bars are also dairy free, egg free and have no refined sugars. Nana’s Cookie Bars have been a favorite of mine for a long time and I am honored to have them be the recipient of this week’s Friday Favorite on BeFreeForMe.com. Congratulations Nana! 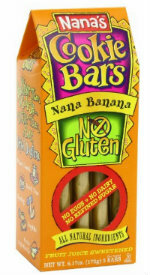 Note: Want to buy Nana’s Banana Cookie Bar’s? Check out this link. This entry was posted on Thursday, May 30th, 2013 at 9:15 pm	and is filed under Friday Favorites. You can follow any responses to this entry through the RSS 2.0 feed. You can leave a response, or trackback from your own site.